There are many ways to prepare your home for the winter. We trade in tank tops for sweaters, and brink out warmer blankets, but what about the floor? No one wants to wake up in the morning and have their feet frozen! Keep your feet cozy and warm this winter with an area rug. Area rugs range in variety from extravagant, antique oriental rugs, to simple and inexpensive. Adding an area rug into your home for the winter will make any room warm and cozy. Area rugs also add color to an otherwise plain room, and complete the look of a room. Fine and oriental rugs are not only cozy additions, but are often so beautiful that they become the centerpiece of the room. 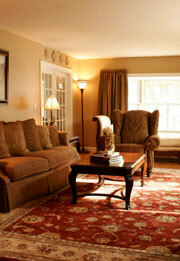 In the colder months area rugs also help to insulate a room, keeping it warm and cozy for guests and residents. Most of the time we see rugs displayed in the living room, but they make wonderful additions to other rooms as well. Often kitchen floors are tile, which is easy to clean but it very cold in the fall and winter. If your home is free of messy eaters a fine rug in the kitchen is pleasing to the eye and the foot. Microfiber area rugs are now readily available. These soft, mat like rugs are easily washed in the machine at home, and are perfect for the kitchen. Get a few, smaller, microfiber rugs for areas of the kitchen where you prepare food and see what an amazing difference it makes. If you spill something on the rug just pop it in the wash! Simpler, inexpensive rugs make lovely additions to kid’s rooms or playrooms. They are easier to clean than carpeting because they can be taken away and thoroughly cleaned by professional cleaners. Even if you have carpeting in the house, it’s a good idea to get an inexpensive area rug to protect the permanent carpeting from crayons, markers, playdough and other non carpet friendly toys. Warm up your home with a lovely, winter area rug. Microfiber rugs is best for family and easy to clean. I like putting rugs at any point in my house because it looks elegant. Continue sharing more design like this one and keep it up.